To say that the new grading policy at Danbury High School has upset some teachers, parents, and students would be an understatement. Several residents are very upset with the changes with some accusing school officials with grade manipulation. During the most recent meeting of the Board of Education, resident Dale Steichen blasted school officials over their grading modifications. Here's a copy of Steichen's letter to the Board of Education. Thanks to those who provided information regarding the allegation of grade manipulation made during the Board of Education meeting on Wednesday. I'm still processing everything I've received and will update everyone over the weekend. The most discussed item during last night's Board of Education meeting centered on the best way to adjust the school calendar due to the unusual amount of snow days that has accumulated this year. 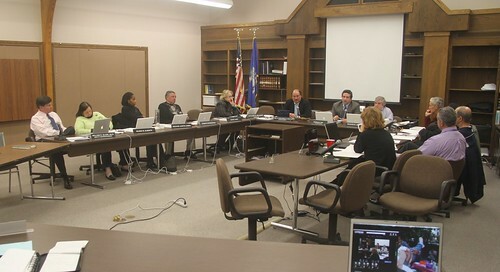 The board voted to hold classes on Feb 17, 18, and 21. Originally, Feb 17 was set as a half day in order for teacher training. As a compliment to the write-up in the News-Times and Danbury Patch, here's video footage of last night's discussion. During the public participation portion of last night's Board of Education meeting in Danbury, a resident launched a serious charge at school officials at Danbury High School with accusations of grade manipulation. From what I recall, the Board did not address this allegation during last night's meeting (although I'm not sure if this matter would be addressed during open session). If any parent has more information on this matter, please contact me at hatcityblog@yahoo.com or on twitter @hatcityblog or @ctblogger. Tonight the Danbury Board of Education plans to vote on their budget for the next fiscal year. I'll be on hand to provide a live video stream of the vote starting at 7:00 PM. This is great news for municipalities such as Danbury that were concerned about the state's commitment to funding education. Gov. Dannel P. Malloy tried Wednesday to erase any doubt he may have created about sparing municipal education grants from the budget axe when he met with the mayors of Connecticut's three largest cities. Surrounded by Pedro Segarra of Hartford, Bill Finch of Bridgeport and John DeStefano of New Haven, Malloy said the budget proposal he will deliver to the legislature next week will include a $1.9 billion Education Cost Sharing program for 2011-12 -- the same funding level provided this fiscal year. "Let me be very clear: Next week's budget will include full funding of ECS," the governor said during a late afternoon press conference outside his Capitol office. "Nobody should be shocked by that." UPDATE: From CTNewsJunkie, here's video of Gov. Malloy's education presser. At last night's Danbury Democratic Town Committee meeting, State Rep. Bob Godfrey updated those in attendance on the border toll proposal that's making the rounds at the Capitol for a second year. For the second straight year, a proposal to establish electronic tolls at state border roads such as Interstate 95 in Greenwich to generate much-needed transportation funding is among the legislative proposals state lawmakers are considering this month. The bill, proposed by state Rep. Tony Guerrera, D-Rocky Hill, a transportation committee co-chair, would install the electronic tolls at borders to collect tolls from out-of-state traffic which currently travels state roads for free. Residents living near the tolls could be provided a tax credit to offset the fees, Guerrera said. Guerrera said the state has few options to pay for transportation projects besides instituting road user fees to replace a drop in state gas tax revenues due to less driving and better fuel economy of hybrid and electric vehicles. "We need to have this conversation because we cannot rely on this gas tax anymore to fix our roads," Guerrera said. "In the next five years you'll probably be looking at cars that get 40 or 50 miles a gallon, and our infrastructure is going to fall apart. It's a huge, huge problem and it needs to be addressed and fixed before something tragic happens." Needless to say, State Rep. Godfrey is not in support of this proposal that places an unfair burden on border communities. 02.16.10: Three dollar border tolls?!? 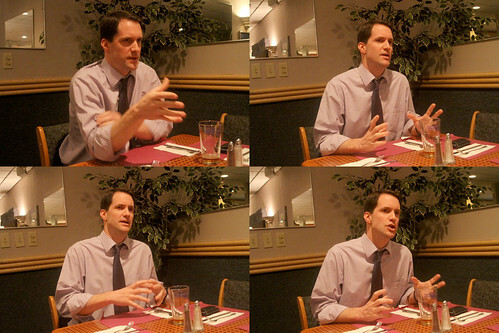 Last week in Norwalk, Congressman Jim Himes sat down and answered a wide range of questions from myself and other bloggers. From the situation in Egypt, to his reflections on his reelection and the currant state of the new Congress, pretty much everything was on the table during the 90 minute interview. Here the first batch of video highlights from the interview. I asked Congressman Himes for his opinion on the his new role as a member of the minority party in the House of Representatives. Recently Congressman Himes is a introduced The Large Capacity Ammunition Feeding Device Act (H.R. 308), which would ban the selling of high capacity gum magazines such as the one use during the assassination attempt of Congresswoman Gabriele Giffords. I asked Congressman Himes to elaborate on the bill and his thoughts on the chances of it being approved by the new Congress. As developments in Egypt seems to change by the minute, I asked the Congressman to give his thoughts on the Obama administration's response to the situation. ...as a follow-up, I asked Congressman Himes to explain why the GOP's rhetoric about cutting spending during last year's campaign doesn't match their record as the new majority in the House of Representatives.